Taste Project and Taste Community Restaurant Receive Grant Award from Amon Carter Foundation. The Amon Carter Foundation has rewarded the success of Taste Project and its Celebrity Server Program with a $30,000 matching grant. The celebrity initiative engaged leaders and influencers in the community and brought increased visibility to Taste Community Restaurant and food insecurity in Tarrant County. 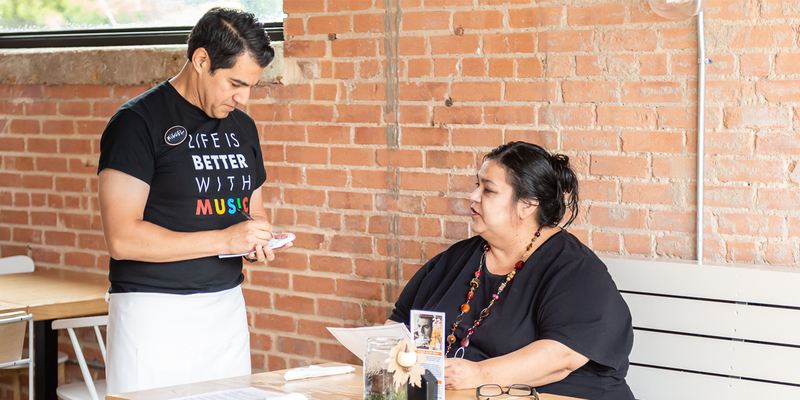 In September, Taste Project partnered with local celebrities and notables to encourage the Fort Worth community to take action and end hunger through Taste Community Restaurant. Celebrities included TCU Athletics; radio personality and businesswoman Charla Corn; Mike Brennan, Megan Henderson, Becky Bethel, Amanda Harrier, Allison Docker, and Natalie Chapa from the Near Southside, Inc. Team; City Councilwoman Ann Zadeh; Kara Sewell from WFAA’s Daybreak; Fort Worth Symphony’s Music Director Miguel Harth-Bedoya; and Doug, Becky, and James Renfro from Renfro Foods. The Fort Worth Community responded! In September nearly 2,000 people dined at Taste Community Restaurant, and over 450 people volunteered. Funds raised on celebrity server days were matched dollar-for-dollar by the Amon Carter Foundation. Taste Community Restaurant is the first project of the Taste Project organization designed to help feed, educate, and serve Tarrant County’s food insecure population, a total of 16.6 percent of Tarrant County’s overall community (Feeding America). Taste Project needs your ongoing support to feed, educate, and serve our community at Taste Community Restaurant. You can join them for lunch, sign up to volunteer, or give online at www.tasteproject.org. Taste Project is a 501(c)3 non-profit established to feed, educate, and serve our community so they may “…taste and see the Lord is good.” Psalm 34:8. We believe everyone should have access to healthy nutritional food. Our vision is to see our community become the solution to the challenges our community faces as it relates to hunger. Our first project, Taste Community Restaurant at 1200 South Main Street in Fort Worth, focuses on healthy, quality meals made from fresh ingredients. Our menu has no prices. This is a give and take concept. We ask guests to do one of the following: 1) pay what you can afford, 2) pay what you would typically pay, or 3) pay what you would typically pay, plus a little extra. To learn more, visit us at www.tasteproject.org or find us on Facebook.